FOR REAL ESTATE YOUR SLIDER SHOULD BE NO LONGER THAN 1/2 METER. Got it? Let’s move on for now, I’ll explain that later. I use the Glidetrack HD Hybrid slider. The company is great – responsive to questions via email and telephone and they were quick to ship (I had my slider in about a week from the date I ordered). I’ve been using this system for over a year and the rails are still clean and smooth. The carriage has a tightening screw to adjust the resistance of your slide (I always keep mine loose) and to lock down the carriage while in transport. I’m pretty rough on my gear (I’m not what you’d call a delicate photographer) so for this to be in such great shape after a year of heavy usage says a lot about the quality of this slider. I’ve traveled around the world with it and it’s still rock solid. I like that it’s (relatively) light weight, small (fits into my overnight suitcase! ), and there’s nothing too complicated about it. They say it’s simple to take apart and clean but after a year and a half of heavy use, I’ve still yet needed to clean mine. What I don’t like is the construction of the table stand elements (I’m not really sure what to call it). On the ends of the track there are four posts with round rubber balls on the ends, meant to provide a means to balance the slider on a flat surface (the rubber balls are a nice way to prevent scratches in furniture, wood floors, etc). The construction and quality of this feature is pretty shoddy. The balls are always falling off and the posts don’t stay tightened. After a few months of use I removed them altogether. I lost a couple of the balls and the posts kept threatening to scratch the h*ll out of everything they came into contact with (including my arms!). That said, I still highly recommend this slider. I’ve only used the HD Hybrid but I’ve heard really great things about Glidetrack’s SD Line – this slider is a little more budget friendly. I’ve also heard good things about the Konova slider, though, I’ve also heard that the Konova takes months for shipping. If you don’t mind the wait I think it’s even cheaper than the Glidetrack SD. But don’t hold me to that. Most people don’t believe me when I say you want to be shooting with a 1/2 meter (at the most!) slider for real estate video. I don’t blame you, I didn’t believe it either which explains why I have a 1 meter Glidetrack HD Hybrid somewhere around here, collecting dust. A 1 meter slider is not supportable by one tripod. You’ll have to use two tripods – one at each end. And you still may want another tripod to support the middle (depending on which slider you go with and how rigid the rails are). That’s potentially THREE TRIPODS to use a slider. 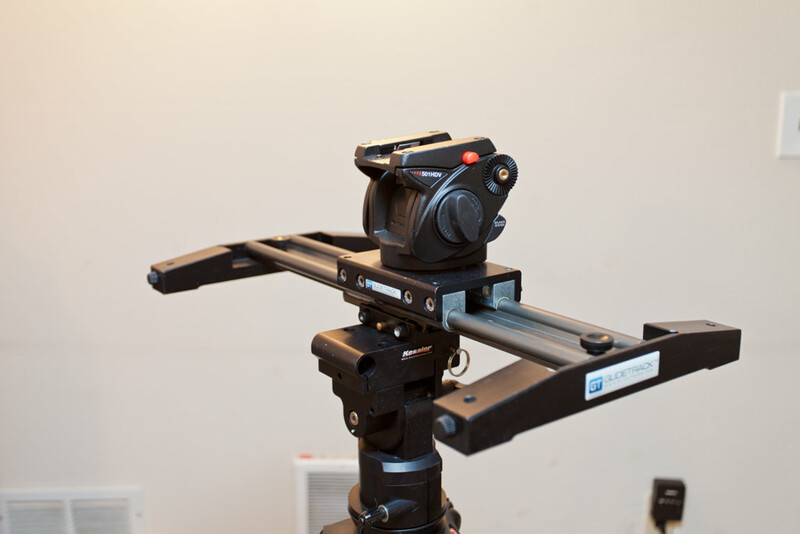 The 1/2 meter slider works on a regular video tripod. Just one. Supported in the middle. Still not convinced? 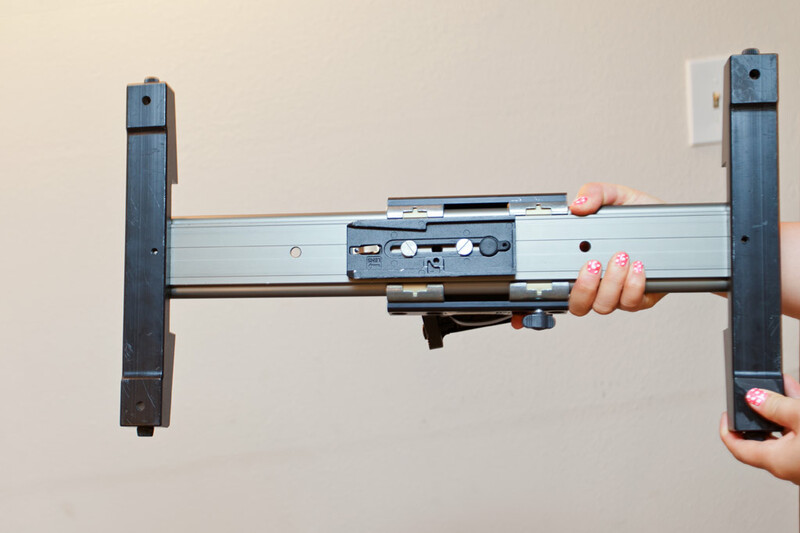 A 1 meter slider, in addition to being HEAVY is just too long to fit into most spaces. Often you’ll find you’re cramming yourself and your slider into a corner, behind furniture, in small bathrooms… get my point? You’re going to want to play around and experiment with speed, moves, and angles and the best way to do that is to start with something longer. A 1 meter (or longer) track is really going to force you to learn to edit. Why? A long slide will give you a clip that ranges from 5-20 seconds, depending on your slide speed. Slides are a pretty boring movement in video so you’ll quickly learn that you’ll want to keep your slide clips to about 3 seconds long. Being forced to trim a 20 second clip down to a 3 second clip is a really good experience for every editor. Seriously. Another reason to start with a longer slider: With a longer slider you won’t fit into the previously mentioned tight spaces so you’ll be forced to think creatively. A lot of videographers do the same slide, back and forth across a room – boring, right? If you can’t fit your slider into the small spaces you’ll be forced to figure out how to do some really interesting moves/angles thereby giving you a leg up on the rest of the videographers in your area (unless you’re in Seattle – haha!). 1) Take the arm off the fluid head (we’ll discuss fluid heads in another post) and move the camera. You’ll have much more control and the arm won’t be constantly poking you and getting in your way. 2) Limit your slide moves to slides only. It’s tempting to try to a pan-slide hybrid and, while I don’t want to stunt anyone’s creativity, it never looks good. This rule actually holds for any move. Do a pan OR a slide OR a crane move OR a detail shot. Combining is never good. 3) If you find you’re having trouble getting smooth slides try adjusting the resistance of your carriage (if you have that option). I’ve heard of people using rubber bands to help with resistance – I’ve never done this but have seen nice results. I think I’d be too afraid of the rubber band breaking and taking an eye out so if you want my opinion, just practice. 4) The slider is going to be your most used piece of gear – I wouldn’t recommend going cheap here. You want quality, durability and, most importantly, reliability. Based on my experience Glidetrack absolutely offers all three. Again, this is not the area to be counting pennies. Go for the best you can afford. 5) I count when I slide. I know I want my finished clip to be around 3 seconds and I also know that the beginning and end should be on movement (I’ll talk about editing in a different post) (maybe). So I start the slide, count to five, and that’s it. Then I only have 2 seconds to trim in editing. This will save you a kabillion hours in editing. 6) Efficiency tip: Keep a QR plate attached to the bottom of your slider for quick setups! Malia - what head do you have between tripod and slider? 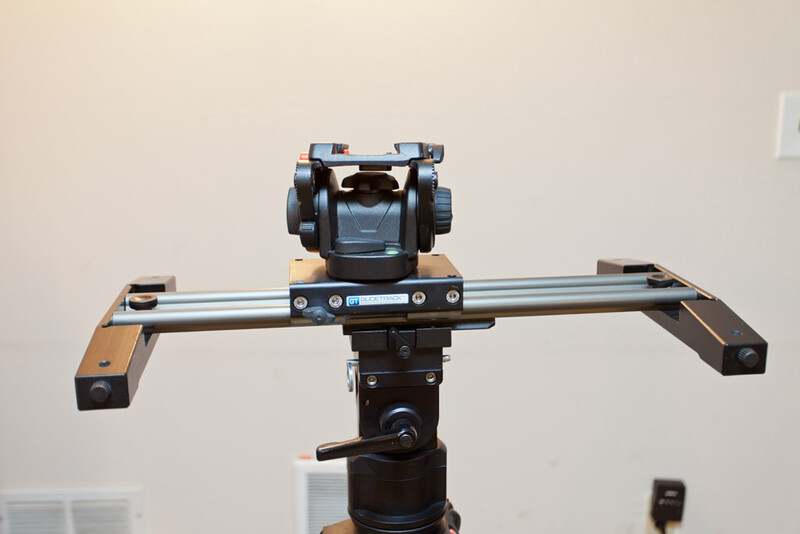 I just thread my slider directly onto the tripod post and the fluid head slides on the carriage as you do. But I'm aware that I often have to level the track by adjusting the tripod legs, which is a pain. I shall Giggle that :-) Thanks. Looking forward to hearing what Glidetrack has to say about the threaded posts/end feet on the sliders. They're AWFUL! A) the balls come un-screwed and fall off way too easily B) the little locking screw things that are supposed to secure the posts are just silly, they're so in-effective. I removed mine, too. For a piece of equipment that's so well designed otherwise, these issues are really surprising.